State and federal funding hasn’t matched rising rents or wages, the leaders of nonprofit organizations and for-profit business serving people with disabilities say. Some organizations serving people with disabilities have had to cut services or even merge to survive. At its peak, the adult day program at Pathway to Choices in San Rafael hosted art, music and other behavioral therapy classes five times a week for 20 Marin County residents with intellectual and developmental disabilities like autism and Down syndrome. But last fall, owner and CEO Juan Velasquez had to shut the program down because the $15,000 a month in operating costs, mostly rent, became too much to sustain. It also got nearly impossible to find workers to staff the program for $15 an hour when they could earn more at nearby fast-food or retail jobs, he said. Velasquez’s East Bay firm still runs similar programs out of locations in Pinole and Sacramento, but the closure in San Rafael meant clients had to seek the services elsewhere — putting a strain on the few remaining day programs in the area. Across the state, organizations like Velasquez’s that collectively serve about 334,000 Californians with disabilities — providing in-home care, behavioral and speech therapy, and job training — are struggling to keep their doors open to a population in need. Most such organizations, which include nonprofit and for-profit enterprises, get the vast majority of their funding from state and federal dollars. That funding, despite annual increases, has not kept up with the rising cost of doing business, especially in the pricey Bay Area, where housing costs and city-mandated minimum wages are among the highest in the country. Between 2012 and 2017, the number of organizations providing these services fell each year for a cumulative drop-off of 14 percent, from nearly 50,000 to just under 43,000, according to the California Department of Developmental Services. The department funds 21 nonprofits known as regional centers, which in turn contract with providers in their geographic area and set the rates at which providers get paid. Locally, the East Bay, Golden Gate, North Bay and San Andreas regional centers determine rates for providers. This fiscal year, the department spent $6.5 billion to fund regional centers. Advocacy groups representing regional centers and service providers are lobbying for an 8 percent rate increase, which would have to be allocated by the state Legislature and approved by the governor. “Right now, with the cost of housing going up, we have many more providers deciding they can’t do business,” said Lisa Kleinbub, executive director of the Regional Center of the East Bay. Anecdotally, dozens of Bay Area providers say their funding stream, which is made up of a patchwork of rates, stagnated or got slashed during the recession in 2009 and 2010. And while some of those cuts have since been restored, they say the rates have yet to catch up to the region’s astronomical increases in the cost of living. Providers are paid different rates for different services: Respite care, which provides a temporary break to full-time caregivers, gets reimbursed at a different rate than day programs, for instance. Each provider negotiates its own rates confidentially with regional centers. It’s difficult to calculate how much those rates have changed overall compared with inflation. 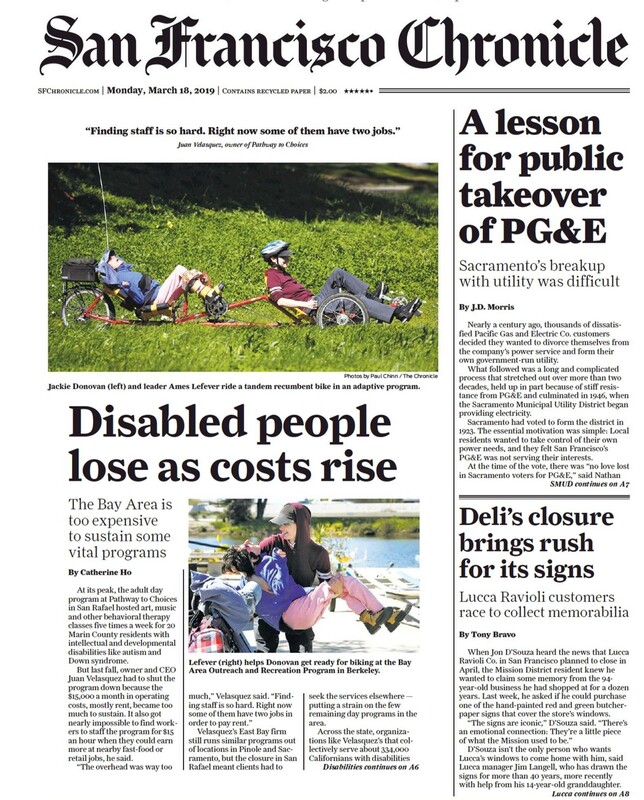 But one estimate found that between 2009 and 2019, the consumer price index rose 25 percent in the San Francisco, Oakland and Hayward region, while per-person spending in the developmental-disabilities system fell 14 percent, after adjusting for inflation, according to advocacy groups lobbying for more state funding for providers. This has left an industry that serves one of the state’s most vulnerable and medically fragile populations struggling to pay workers a competitive wage, eliminating some longtime services like transportation, and grappling with how to position themselves for long-term survival. Nonprofit providers are turning more to fundraising from foundations and private donors to make ends meet, but for-profit service providers like Velasquez’s company don’t have that option. Gatepath, a Redwood City nonprofit that runs preschool programs for children with developmental disabilities, last month merged with another nonprofit, Palo Alto’s Abilities United, in part to ensure that they’d both remain financially viable. “With the rising tide of cost and no rate relief in sight, the need to merge or share more (resources) was very clear,” said Gatepath CEO Bryan Neider. Alchemia, a nonprofit that holds art classes for people with disabilities in Marin and Sonoma counties, recently discontinued its daily shuttle service after eight years because it needed to redirect the money to core services and staff, said Elizabeth Clary, the group’s executive director. Many providers got a rate increase in 2016, when the California Legislature passed a law requiring many regional centers to boost wages and benefits for staffers who spend at least 75 percent of their time working directly with recipients of care or training. That increase worked out to a roughly 5 to 15 percent increase in payments for many providers, but it wasn’t enough to halt the exodus of workers leaving the demanding field for higher-paid entry-level jobs in the retail, fast-food and security sectors. Because of a quirk in state law, providers don’t get an automatic rate bump from the state when local minimum wage increases kick in — meaning they have to pay their workers more in order to follow city-mandated minimum wage laws, but don’t get more money from the state to help them do so. The 2016 rate increase allowed Heinz to bump up some of his employees’ wages from $14 to $16 an hour. Still, 115 of his workers left for higher-paying jobs over the course of the year — a 62 percent turnover rate. Heinz said he hasn’t had to cancel any programs, but he doesn’t have the capacity to take on new clients. The number of people who need services, meanwhile, is growing each year, in part because more people are diagnosed on the autism spectrum and many who’ve been in the system for years need more care as they age. “That’s where the rub is right now,” Heinz said. “We can’t accept new referrals, and there’s a huge demand of people who want these services.